Recent adaptive radiations provide striking examples of convergence, but the predictability of evolution over much deeper timescales is controversial, due to a scarcity of ancient clades exhibiting repetitive patterns of phenotypic evolution. Army ants are ecologically dominant arthropod predators of the world's tropics, with large nomadic colonies housing diverse communities of socially parasitic myrmecophiles. Remarkable among these are many species of rove beetle (Staphylinidae) that exhibit ant-mimicking “myrmecoid” body forms and are behaviorally accepted into their aggressive hosts' societies: emigrating with colonies and inhabiting temporary nest bivouacs, grooming and feeding with workers, but also consuming the brood. Here we demonstrate that myrmecoid rove beetles are strongly polyphyletic, with this novel adaptive morphological and behavioral syndrome having evolved at least twelve times during the evolution of a single staphylinid subfamily, Aleocharinae. Each independent myrmecoid clade is restricted to one zoogeographic region and highly host-specific on a single army ant genus. Dating estimates reveal that myrmecoid clades are separated by substantial phylogenetic distances—as much as 105 million years (My). All such groups arose in parallel during the Cenozoic, as army ants are proposed to have risen to ecological dominance. This work uncovers a rare example of an ancient system of complex morphological and behavioral convergence, with replicate beetle lineages following a predictable phenotypic trajectory during their parasitic coevolution with army ants. The degree to which biological evolution is idiosyncratic or predictable is a fundamental question in evolutionary biology. Convergence—the acquisition of similar traits in different taxa evolving under comparable selective regimes—provides a compelling argument for predictability in evolutionary change. The most striking convergent systems are recent adaptive radiations, in which independent lineages have followed seemingly parallel evolutionary trajectories. Darwin's finches , Caribbean anoles , Heliconius butterflies , African lake cichlids  and sticklebacks  are natural experiments, where exposure to common selection pressures has led to near-identical phenotypes in populations adapting to similar niches. Although predictable evolution is manifestly demonstrated in these systems, the likelihood of convergence is nevertheless enhanced by their young ages: the close genetic relatedness of lineages is expected to bias the production of genetic variation, enhancing the probability that similar traits will evolve repeatedly [6,7]. Molecular studies of such recently descended convergent taxa support this notion, often revealing selection acting on the same loci or signaling pathways [8,9]. With increasing phylogenetic divergence between taxa, however, the likelihood of such marked convergence decreases . Ancient clades displaying equivalently conspicuous repeated evolution are rare, lending apparent credence to Gould's view that evolution is inherently contingent , and that adaptive responses to a given selection pressure are likely to be different in distantly related taxa. Here, we report a novel example of predictable evolution of a highly complex phenotype that has occurred over a deep timescale. We have explored the evolutionary origins of specialized rove beetles (Staphylinidae) that live symbiotically with army ants, uncovering an ancient system of striking parallel evolution. Army ants are dominant eusocial predators of the world's tropics: their colonies are nomadic, with hundreds of thousands of workers that emigrate between temporary nest sites and engage in group foraging (raiding) to harvest invertebrate prey [12–14]. Although notoriously aggressive, army ant colonies represent major concentrations of resources, attracting numerous myrmecophiles that form obligate symbioses with their hosts [15–17]. Diverse taxa including mites, silverfish, flies, wasps and beetles exploit this resource, employing either defensive morphologies, or behavioral and chemical strategies to evade worker hostility. A dramatic manifestation of this lifestyle occurs in numerous genera of the staphylinid subfamily Aleocharinae, where the beetles anatomically mimic their host ants and are recognized and accepted by them [15,18–20]. Such species live as behaviorally integrated social parasites—appearing at least partially assimilated into colony life, but simultaneously feeding on the ants' brood and raided food. In contrast to the majority of the ~16,000 species of Aleocharinae, which are mainly free-living species with “generalized” staphylinid morphology and extremely similar in body form , ant-like “myrmecoid” aleocharines are heavily modified (Fig 1A), with a petiolate abdomen (a narrowed waste and expanded gaster), elongate appendages, geniculate (elbowed) antennae, and further similarities to host ant body size, thorax shape and cuticle sculpturation. The myrmecoid ecomorph is thought to mediate tactile mimicry of nestmate recognition cues [18,20,22–24], and is accompanied by a suite of behaviors, including frequent grooming and licking of workers [25,26], cohabitation of temporary nesting bivouacs, and synchronicity with the colony where the beetles emigrate with hosts and join them on raids, sometimes being carried by or phoretically attaching to workers [27,28]. Where known, the beetle's cuticular hydrocarbons match those of the host , and novel glands on the beetles' cuticles are thought to facilitate chemical integration into the ant society . In species associated with day-raiding army ants, mimicry of host body color also occurs, performing a possible role in Batesian mimicry to protect against predators in . Figure 1. Myrmecoid Syndrome in aleocharine rove beetles. A: Examples of free-living Aleocharinae with generalized morphology, Oxypoda and Atheta. B: Examples of army ant sociall parasites with myrmecoid morphology, Ecitocryptus (associated with Nomamyrmex) and the eyeless, elytra-less Pseudomimeciton (associated with Labidus). C–E: Living myrmecoids with host ants: Ecitophya with Eciton host (Peru), Aenictoteras with Aenictus host (Malaysia), Beyeria with Neivamyrmex host (Ecuador). The myrmecoid morphological and behavioral syndrome presents an evolutionary puzzle: because the morphology of these beetles is so strongly modified, their phylogenetic relationships to other aleocharines are obscure. Prominent aleocharine authors have proposed conflicting evolutionary scenarios: Seevers [18,19] argued for a single principal origin of these beetles within Aleocharinae, forming the large tribe Dorylomimini [30,31], and posited an ancient association with army ants followed by codiversification with hosts throughout the tropics. In contrast, Kistner and co-workers argued for multiple origins [23,24,32,33], splitting Dorylomimini into numerous small tribes and invoking potentially widespread—and extraordinary—morphological and behavioral convergence. Neither scenario has been tested phylogenetically, and to date, the relationships of these beetles are unknown. A molecular approach is essential but has been practically unimaginable due to difficulties in obtaining specimens. The beetles rank among the rarest and most challenging of insects to find in nature, with many known only from a small number of museum specimens. In this study, we present the outcome of efforts to collect these beetles and explore their evolutionary relationships. Over the course of a decade, we observed army ant raids and emigrations across the World's tropics, accumulating aleocharines associated with all known army ant genera. In reconstructing the evolutionary history of these specialized myrmecophiles, we uncovered evidence of conspicuous, repeated evolution over deep time that runs counter to the notion of evolutionary contingency, and represents a new paradigm for understanding interspecies relationships. Army ants include the genera Eciton, Labidus, Neivamyrmex, Nomamyrmex in the New World and Aenictus and Dorylus in the Old World. These “true” army ants exhibit classical nomadic biology , and are split into separate Old and New World clades within the ant subfamily Dorylinae [30,31]. We collected aleocharines associated with all of these genera, as well as from two distantly related ants that display army-ant-like group foraging behavior: Carebara (Myrmicinae) and Liometopum (Dolichoderinae). Both generalized and myrmecoid aleocharines were collected, and to avoid subjectivity on our part, we defined myrmecoid species as those with petiolate abdomens and long legs that have been judged by previous authors to be myrmecoid [19,23,24,32–34]. Because most species and many genera we collected were new to science, we extracted DNA from specimens non-destructively [35,36] so they could be taxonomically described [37-39 and ongoing efforts], and sequenced the five loci that have previously been used successfully in aleocharine phylogenetics: nuclear 28s rRNA, 18s rRNA and Topoisomerase 1; mitochondrial COI and 16s rRNA [40–42]. Amy ant myrmecophile data were integrated with sequences from free-living, morphologically generalized taxa representing a broad taxonomic spectrum of Aleocharinae including all major tribes, and outgroups belonging to the tachyporine-group of staphylinid subfamilies to which Aleocharinae belongs [43–45]. We performed Bayesian phylogenetic inference on the resulting 181-taxon matrix (see Materials and Methods in Supplemental Online Information). The topology produced by this analysis, along with exemplar beetle and host ant images, is shown in Figure 2. Figure 2. Bayesian consensus tree of Aleocharinae. Myrmecoid clades are highlighted in orange, with representative taxa shown along with their respect host army ant genera. Clade/lineage numbers indicate independent instances inferred from Dollo-type parsimony optimization and correspond to the numbers in Figure 3 and in the Supplemental Discussion. Generalized, free-living species that embody the ancestral morphology in Aleocharinae are also shown for comparison. Circles on nodes signify posterior probability (PP) values: open circles: PP > 0.95; closed circles, PP > 0.9. “APL” marks the “Athetini, Pygostenini, Lomechusini” clade; “F” labels the “False Lomechusini” clade. The pattern of morphological convergence is dramatic and clear to the eye. Generalized aleocharines form an ancestral backbone to the tree, from which numerous elaborate myrmecoid lineages have emerged in parallel across the subfamily (Fig 2, Fig S1). Each independent origin of the myrmecoid ecomorph is represented by a small clade or single taxon that is host-specific on a single army ant genus. All potential host genera are targeted: each of the “true” army ants belonging to Dorylinae have their own, dedicated symbiont clade(s), and so too do the group-foraging ants Liometopum and Carebara. We estimated the number of times this has arisen across the tree using parsimony optimization and Bayesian ancestral state reconstruction. For parsimony we assumed dollo-type irreversibility of myrmecoid morphology, which may be a valid assumption in this system: the “tippy” distribution of this myrmecoid lineages across the tree is consistent with it being a terminal phenotype, and an improbably large number of regains of primitive characters would be required for a lineage to lose myrmecoid morphology and restore generalized aleocharine morphology (together with a reversion to ancestral ecology). Such a model of evolution produces the fifteen instances of myrmecoid evolution depicted in Figure 2. However, for a more conservative estimate that takes branch lengths and support values into account, and includes the possibility of trait reversal, ancestral states were calculated over a tree distribution using BAYESTRAITS , which gave an estimate of 12 independent origins (Fig S1). We think that 12–15 origins is surely an underestimate: there remain numerous myrmecoid genera associated with both Old and New World army ants that we have thus far been unable to collect, some of which—given the polyphyletic evolution of this syndrome— likely represent additional independent origins. A detailed morphological study of myrmecoid clades and their generalized sister groups revealed aspects of mouthpart and genitalia morphology that provide supporting characters for some of our molecular groupings (see “Systematic Relationships of Myrmecoid Aleocharinae” in Supplemental Discussion, which also includes a summary of the known behavior of each clade; a full systematic review will be published elsewhere). Importantly, we see no evidence in any of the myrmecoid clades of a beetle promiscuously switching to a different host genus, indicating that all of these relationships are highly host specific. The converse of this relationship does not hold, however, with some ant genera—Aenictus and Dorylus in particular—playing host to more than one myrmecoid beetle lineage. The stringency with which each beetle clade associates with a single ant genus likely extends to the species level, since individual beetle species have generally been recorded living with a single army ant species [18,19]. From this evolutionary pattern we determine the following: i) separate lineages of Aleocharinae have evolved to socially parasitize each of the different host ant genera; ii) during subsequent coevolution of these lineages with ants, they have specialized and become host-specific; iii) most dramatically, their morphology and aspects of behavior have followed a predictable evolutionary trajectory, leading to an overtly stereotyped symbiosis. Cumulatively the outcome is an extraordinary system of parallel evolution in the classical sense, where multiple ancestral taxa sharing a relatively conserved body plan have each evolved in the same direction . To gauge the time scale over which this parallel system has emerged, we dated the tree using a Bayesian lognormal relaxed clock in BEAST 2 . Nodes were calibrated with fossils in Cretaceous Burmese and Middle Eocene Baltic ambers, and a compression fossil of the Jurassic Talbragar Fish Bed (see Materials and Methods in Supplemental Online Information). We varied the stringency of our calibration densities to evaluate the impact of our priors on nodes dates, and also performed analyses without certain fossils of questionable placement. Our analyses consistently show that virtually all myrmecoid clades arose in parallel during the Cenozoic (Fig 3). This temporal window is consistent with when ants in general (including army ants) are thought to have risen to ecological dominance [49–51], promoting the diversification of myrmecophiles [20,52,53]. Although army ant dating estimates are problematic due to limited fossils for calibration (only a single, Miocene Dominican amber Neivamyrmex is known ) recent dating estimates hypothesize that stem-groups of army ant clades within Dorylinae date to the Upper Cretaceous (~80 Mya)  or Palaeocene-Eocene boundary (~57–56 Mya) . These clades subsequently radiated into crown-group genera between ~35 and 20 Mya, broadly consistent with the origins of myrmecoid clades inferred in this study, although we see no clear relationship between the age of each ant genus and its corresponding myrmecoid lineage(s) (data not shown). Of foremost interest, however, is that we estimate the most recent common ancestor of all myrmecoid clades to have existed in the Early to mid-Cretaceous. In our focal analysis, this ancestor lived ~105 Mya (Fig 3). There is thus an ancient and inherent potential for Aleocharinae to evolve symbioses with army ants, which was realized by multiple lineages in parallel during the Cenozoic, and which has led to the repeated evolution of symbionts with matching ecomorphologies and similar behaviors over an extraordinarily deep timescale. Even though evolutionary instances of myrmecoid syndrome are not evenly distributed across the subfamily, this pattern appears to holds true for the subfamily at large: twelve of the fifteen myrmecoid lineages are clustered within a clade, “APL” (Fig 2, 3), comprised of the tribes Pygostenini, Lomechusini and the vast, paraphyletic Athetini, where myrmecoid lineages occur among the “False Lomechusini” group of athetines in particular (clade F) [40,41,56]—a clade that consists of multiple New World athetine genera formerly placed in Lomechusini . This bias probably represents the tropical dominance of the APL clade relative to other aleocharine lineages, with ecological coexistence with army ants acting to elevate the likelihood of APL lineages evolving this type of symbiosis (in contrast, within the speciose but mostly temperate tribe Oxypodini (Clade O), we see no myrmecoid lineages emerging; Fig 3). Despite this lineage clustering, the APL clade is itself still comparatively ancient, dating to 84.77 My, and the three sporadic instances seen outside the APL clade attest to a potential for evolving myrmecoid syndrome that extends broadly across the Aleocharinae. These instances are the Neotropical Labidus-associated tribe Mimecitini , the Liometopum-associated Sceptobius schmitti in the Western USA , and the Indomalyan Aenictus-associated Myrmecosticta that emerges within Aleocharini (Clade A) —a tribe that is moderately prevalent in the tropics. Figure 3. Dating the evolution and ancestry of myrmecoid clades. Dated phylogeny produced by BEAST 2 and 8 calibration points under a Bayesian Lognormal Relaxed clock, with separate clocks for nuclear and mitochondrial data. Myrmecoid clades are highlighted in orange. Clade numbers corresponding to those in Figure 2. The APL, F, O (Oxypodini) and A (Aleocharini) clades are highlighted. What circumstances permitted this deep-time parallel evolutionary system to arise? 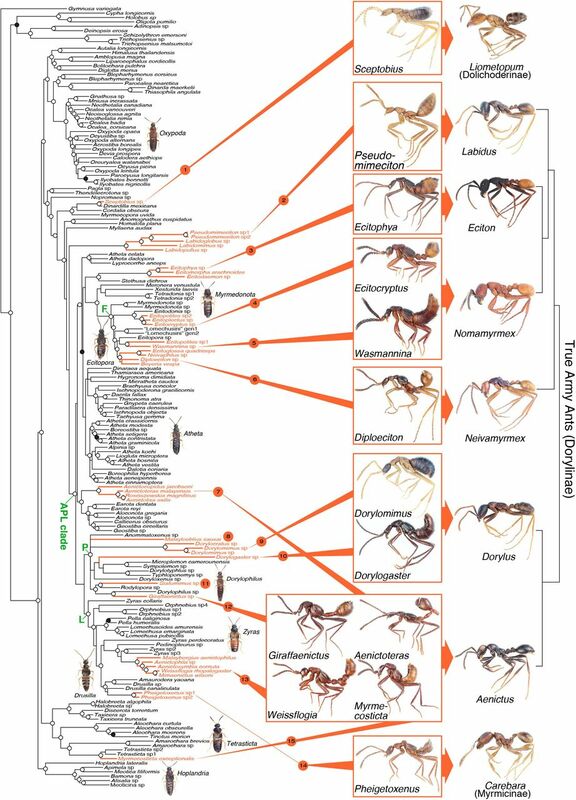 We deduce that historical selection pressures imposed by different army ant genera on separate aleocharine lineages were likely similar; so too were the adaptive responses of the beetles as they coevolved with their hosts. This inherency in the outcome of selection begs the question of why myrmecoid syndrome has evolved repeatedly in Aleocharinae in particular, as opposed to all other groups of beetles, including the 31 other staphylinid subfamilies numbering some 45,000 species—most of which have generalized staphylinid morphology similar to aleocharines. We have previously argued that in contrast to other beetles, aleocharines are ancestrally preadapted for social parasitism of ants in general, and morphologically preadapted to evolve myrmecoid shape in particular when exposed to specific selection pressures imposed by army ants or other group-foraging hosts . Aleocharinae's combination of predatory habits, small body size, and major defensive capacity in the form of a tergal gland on the dorsal abdomen constitute a groundplan unique among Coleoptera; this suite of characters predisposes members of the subfamily to successful entry and exploitation of ant colonies , providing the basis for why myrmecophily has evolved an inordinate number of times [15,18,20], including repeated associations with army ants . Based on our present findings, we further posit that aleocharines that are specialized on army ants commonly gain a selective advantage from social integration, with many such lineages experiencing intense selection on body shape to conform to an ant-like morphology that enables the beetles to pass tactile assessment by workers [18,20,22–24]. If the narrow niche of social acceptance demands an ant-like shape, then the generalized aleocharine body form, comprising short elytra and an exposed, flexible abdomen, is especially conducive to this developmental modification [19–21]. Consequently, aleocharines are evolutionary poised for myrmecophily and also for becoming myrmecoid as the predominant socially parasitic strategy when specializing on army ants. We propose that such a near-clade-wide preadaptive ground state may underlie the repeated evolution of myrmecoid syndrome across the aleocharine tree. Documented examples of deep-time convergence are mostly limited to the evolution of single traits with few instances of repeated evolution, and where a narrow range of alternative functional solutions are available. The independent origin of wings for flight in birds, bats and insects is a prime example. Similarly, although an expanding body of work has shown that parallel genetic changes can occur in extremely widely separated taxa [59,60], such examples are typically functionally equivalent mutations in single, broadly conserved genes that govern relatively simple traits, such as pigmentation [61–63] or toxin resistance . In contrast, we have presented evidence that a complex morphological and behavioral syndrome has evolved recurrently over >100 My, across a clade approximately equal in species richness to mammals and birds combined. Such a system of predictable evolution challenges Gould's view that if the tape of life were replayed, an entirely different assemblage of life would exist . On the contrary, our results argue that the tape of life is highly predictable whenever aleocharines ecologically coexist with army ants—a consequence we think of ancestral, near-clade-wide inherency for specialization on army ants and evolving the myrmecoid body shape. We note, however, that despite this overarching deterministic pattern, there is nevertheless an element of contingency: as Seevers noted , the construction of the abdominal petiole differs among myrmecoid aleocharines, from a weak narrowing of the abdominal base (e.g Wasmannina, Sceptobius) to a strong constriction (Pseudomimeciton, Myrmecosticta), to a thin waste (Diploeciton, Giraffaenictus) to taxa with distinct petiolar and postpetiolar segments (Ecitocryptus, Weissfloggia); additionally, not all species have fully geniculate antennae, and some have unique, dramatic specializations, such as the gland-associated abdominal lobes of Aenictoteras, and the complete loss of eyes and elytra in Pseudomimeciton. Hence, evolution appears to have followed slightly different routes in achieving the ant-like shape, and there are likely further differences in the behavioral interactions of different myrmecoid taxa with hosts . Whether this spectrum of variation represents an evolutionary continuum of specialization is unclear, but we posit that at least some apparently idiosyncratic elements in this otherwise parallel system stem from clade-specific peculiarities: differences between ancestral genotypes and phenotypes of each myrmecoid lineage, disparities in selection pressures imposed by distinct army ant taxa, as well mutational and environmental stochasticity. Future studies exploiting the parallel nature of this system promise to reveal much about the genetic and evolutionary forces shaping intricate symbioses in the animal kingdom. We are grateful to numerous people for assistance with fieldwork or permitting to collect army ant myrmecophiles, in particular Rosli Hashim, Takashi Komatsu, Taku Shimada, Christoph von Beeren, Taro Eldredge, Stefan Harrison and Ian Butler. Alfred Newton and Margaret Thayer (Field Museum of Natural History), Taro Eldredge (University of Kansas), Terry Ord (University of New South Wales) and Christoph von Beeren (TU Darmstadt) provided important feedback on the manuscript. This work was supported by Grant-in-aid # XXXXX to MM, and a Sir Henry Wellcome Postdoctoral Fellowship and NIH support to JP. Grant PR, Grant BR, Markert JA, Keller LF, Petren K. Convergent Evolution Of Darwin's Finches Caused By Introgressive Hybridization And Selection. Evolution 2004;58:1588. doi:10.1554/04-016. Losos J, Jackman T, Larson A, Queiroz K, Rodriguez-Schettino L. Contingency and determinism in replicated adaptive radiations of island lizards. Science 1998;279:2115–8. Merrill RM, Dasmahapatra KK, Davey JW, Dell'Aglio DD, Hanly JJ, Huber B, et al. The diversification of Heliconius butterflies: what have we learned in 150 years? J Evol Biol 2015;28:1417–38. doi:10.1111/jeb.12672. Kocher TD, Conroy JA, McKaye KR, Stauffer JR. Similar morphologies of cichlid fish in Lakes Tanganyika and Malawi are due to convergence. Mol Phylogenet Evol 1993;2:158–65. doi:10.1006/mpev.1993.1016. Bell MA, Foster SA. The Evolutionary Biology of the Threespine Stickleback. Oxford: Oxford University Press; 1994. Haldane JBS. The Causes of Evolution. Princeton University Press; 1932. Schluter D, Clifford EA, Nemethy M, McKinnon JS. Parallel Evolution and Inheritance of Quantitative Traits. The American Naturalist 2004;163:809–22. doi:10.1086/383621. Colosimo PF, Hosemann KE, Balabhadra S, Villarreal G, Dickson M, Grimwood J, et al. Widespread parallel evolution in sticklebacks by repeated fixation of Ectodysplasin alleles. Science 2005;307:1928–33. doi:10.1126/science.1107239. Reed RD, Papa R, Martin A, Hines HM, Counterman BA, Pardo-Diaz C, et al. optix Drives the Repeated Convergent Evolution of Butterfly Wing Pattern Mimicry. Science 2011;333:1137–41. doi:10.1126/science.1208227. Ord TJ, Summers TC. Repeated evolution and the impact of evolutionary history on adaptation. BMC Evol Biol 2015;15:137. doi:10.1186/s12862-015-0424-z. Gould SJ. Wonderful life: the Burgess Shale and the nature of history 1990. Schneirla TC. Army Ants: A Study in Social Organization. San Francisco: W.H. Freeman; 1971. Gotwald WH. Army Ants: the Biology of Social Predation. Cornell University Press, Ithaca; 1995. Kronauer DJC. Recent advances in army ant biology (Hymenoptera: Formicidae). Myrmecological News 2009;12:51–65. Kistner DH. The Social Insects' Bestiary. In: Hermann HR, editor. Social Insects, vol. 3, Academic Press; 1982, pp. 1–244. Hölldobler B, Wilson EO. The Ants. Harvard University Press; 1990. Rettenmeyer CW, Rettenmeyer ME, Joseph J, Berghoff SM. The largest animal association centered on one species: the army ant Eciton burchellii and its more than 300 associates. Insectes Sociaux 2010;58:281–92. doi:10.1007/s00040-010-0128-8. Kistner DH. Social and evolutionary significance of social insect symbionts. In: Hermann HR, editor. Social Insects, vol. I, Academic Press;, 1979, pp. 339–413. Seevers CH. The systematics, evolution and zoogeography of staphylinid beetles associated with army ants (Coleoptera, Staphylinidae). Fieldiana Zoology 1965;47:137–351. Parker J. Myrmecophily in beetles (Coleoptera): evolutionary patterns and biological mechanisms. Myrmecological News 2016;22:65–108. Seevers CH. A generic and tribal revision of the North American Aleocharinae (Coleoptera: Staphylinidae). Fieldiana Zoology 1978;71:i–289. doi:10.5962/bhl.title.3136. Rettenmeyer CW. Insect mimicry. Annu Rev Entomol 1970;15:43–74. Kistner DH, Jacobson HR. Cladistic analysis and taxonomic revision of the ecitophilous tribe Ecitocharini with studies of their behaviour and evolution (Coleoptera, Staphylinidae, Aleocharinae). Sociobiology 1990;17:333–480. Kistner DH. Cladistic analysis, taxonomic restructuring and revision of the Old World genera formerly classified as Dorylomimini with comments on their evolution and behavior (Coleoptera: Staphylinidae). Sociobiology 1993;22:147–383. Akre RD, Rettenmeyer CW. Behavior of Staphylinidae Associated with Army Ants (Formicidae: Ecitonini). Journal of the Kansas Entomological Society 1966;39:745–82. Akre RD, Torgerson RL. The behavior of Diploeciton nevermanni, a staphylinid beetle associated with army ants. Psyche 1968;75:211–5. Kistner DH, Jacobson HR. A review of the myrmecophilous Staphylinidae associated with Aenictus in Africa (Coleoptera; Hymenoptera, Formicidae). Sociobiology 1975;1:20–73. 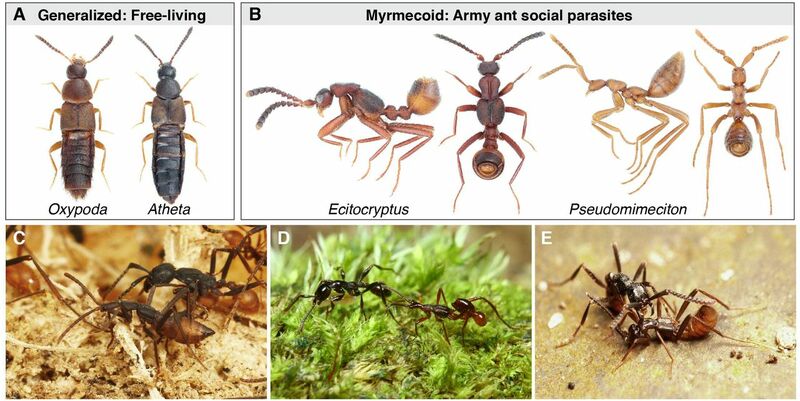 Maruyama M, Akino T, Hashim R, Komatsu T. Behavior and cuticular hydrocarbons of myrmecophilous insects (Coleoptera: Staphylinidae; Diptera: Phoridae; Thysanura) associated with Asian Aenictus army ants (Hymenoptera; Formicidae). Sociobiology 2009;54:19–35. Hölldobler B. Communication between Ants and Their Guests. Sci Am 1971;224:86–93. doi:10.1038/scientificamerican0371-86. Brady SG. Evolution of the army ant syndrome: the origin and long-term evolutionary stasis of a complex of behavioral and reproductive adaptations. Proc Natl Acad Sci USa 2003;100:6575–9. doi:10.1073/pnas.1137809100. Brady SG, Fisher BL, Schultz TR, Ward PS. The rise of army ants and their relatives: diversification of specialized predatory doryline ants. BMC Evol Biol 2014;14:93–3. doi:10.1186/1471-2148-14-93. Jacobson HR, Kistner DH. Cladistic study, taxonomic restructuring, and revision of the myrmecophilous tribe Leptanillophilini with comments on its evolution and host relationships (Coleoptera: Staphylinidae; Hymenoptera: Formicidae). Sociobiology 1991;18:1–150. Jacobson HR, Kistner DH. Cladistic Study, Taxonomic Restructuring, and Revision of the Myrmecophilous Tribe Crematoxenini with Comments on Its Evolution and Host Relationships (Coleoptera, Staphylinidae, Hymenoptera, Formicidae). Sociobiology 1992;20:91–198. Kistner DH. A new genus and twelve new species of ant mimics associated with Pheidologeton (Coleoptera, Staphylinidae; Hymenoptera, Formicidae). Sociobiology 1983;8:155–98. Gilbert MTP, Moore W, Melchior L, Worobey M. DNA Extraction from Dry Museum Beetles without Conferring External Morphological Damage. PLoS ONE 2007;2:e272. doi:10.1371/journal.pone.0000272. Parker J, Maruyama M. Jubogaster towai, a new Neotropical genus and species of Trogastrini (Coleoptera: Staphylinidae: Pselaphinae) exhibiting myrmecophily and extreme body enlargement. Zootaxa 2013;3630:369–78. doi:10.11646/zootaxa.3630.2.11. Maruyama M, . Giraffaenictus eguchii (Coleoptera, Staphylinidae, Aleocharinae), a new genus and species of fully myrmecoid myrmecophile from a colony of Aenictus binghami (Hymenoptera, Formicidae, Aenictinae) in Vietnam. Esakia 2008;48:51–6. Maruyama M, Matsumoto T, Itioka T. Rove beetles (Coleoptera: Staphylinidae) associated with Aenictus laeviceps (Hymenoptera: Formicidae) in Sarawak, Malaysia: Strict host specificity, and first myrmecoid Aleocharini. Zootaxa 2011;3102:1–26. Maruyama M, Komatsu T, Katayama Y, Song X-B, Sakchoowong W. Myrmecophilous rove beetles (Coleoptera: Staphylinidae) associated with Aenictus hodgsoni (Hymenoptera: Formicidae) from Thailand, with description of two new genera and three new species. Zootaxa 2014;3796:361–13. doi:10.11646/zootaxa.3796.2.8. Elven H, Bachmann L, Gusarov VI. Phylogeny of the tribe Athetini (Coleoptera: Staphylinidae) inferred from mitochondrial and nuclear sequence data. Mol Phylogenet Evol 2010;57:84–100. doi:10.1016/j.ympev.2010.05.023. Elven H, Bachmann L, Gusarov VI. Molecular phylogeny of the Athetini-Lomechusini-Ecitocharini clade of aleocharine rove beetles (Insecta). Zoologica Scripta 2012;41:617–36. doi:10.1111/j.1463-6409.2012.00553.x. Osswald J, Bachmann L, Gusarov VI. Molecular phylogeny of the beetle tribe Oxypodini (Coleoptera: Staphylinidae: Aleocharinae). Systematic Entomology 2013;38:507–22. doi:10.1111/syen.12011. Lawrence JF, Newton AF. Evolution and classification of beetles. Annual Review of Ecology and Systematics 1982:261–90. Thayer MK. Staphylinidae Latreille, 1802. In: Beutel RG, Leschen RAB, editors. Handbuch Der Zoologie/Handbook of Zoology, Vol. IV (Arthropoda: Insecta), Part 38 Coleoptera, Beetles. Volume 1: Morphology and Systematics (Archostemata, Adephaga, Myxophaga, Polyphaga Partim)., Berlin and New York:, 2005, pp. 296–344. Ashe JS. Phylogeny of the tachyporine group subfamilies and “basal” lineages of the Aleocharinae (Coleoptera: Staphylinidae) based on larval and adult characteristics. Systematic Entomology 2005;30:3–37. doi:10.1111/j.1365-3113.2004.00258.x. Pagel M, Meade A, Barker D. Bayesian estimation of ancestral character states on phylogenies. Syst Biol 2004;53:673–84. doi:10.1080/10635150490522232. Futuyma DJ. Evolution. Sinauer Associates Incorporated; 2013. Bouckaert R, Heled J, Kühnert D, Vaughan T, Wu C-H, Xie D, et al. BEAST 2: A Software Platform for Bayesian Evolutionary Analysis. PLoS Comput Biol 2014;10:e1003537–6. doi:10.1371/journal.pcbi.1003537. Grimaldi D, Agosti D. A formicine in New Jersey Cretaceous amber (Hymenoptera: Formicidae) and early evolution of the ants. Proc Natl Acad Sci USa 2000;97:13678–83. doi:10.1073/pnas.240452097. Wilson EO, Hölldobler B. The rise of the ants: A phylogenetic and ecological explanation. Proceedings of the National Academy of Sciences 2005;102:7411–4. doi:10.1073/pnas.0502264102. LaPolla JS, Dlussky GM. Ants and the Fossil Record. Annu Rev Entomol 2013;58:609–30. Parker J, Grimaldi DA. Specialized Myrmecophily at the Ecological Dawn of Modern Ants. Curr Biol 2014;24:2428–34. doi:10.1016/j.cub.2014.08.068. Parker J. Emergence of a superradiation: pselaphine rove beetles in mid-Cretaceous amber from Myanmar and their evolutionary implications. Systematic Entomology 2016:n/a–n/a. doi:10.1111/syen.12173. Wilson EO. Ants of the Dominican Amber (Hymenoptera: Formicidae). 2. The First Fossil Army Ants. Psyche: a Journal of Entomology 1985;92:11–6. doi:10.1155/1985/63693. Borowiec M. Generic revision of the ant subfamily Dorylinae (Hymenoptera, Formicidae). Zookeys 2016;608:1–280. doi:10.3897/zookeys.608.9427. Mathis KA, Eldredge KT. Descriptions of two new species of Myrmedonota Cameron (Staphylinidae: Aleocharinae) from Mexico with comments on the genus taxonomy and behavior. Zootaxa 2014;3768:95–6. doi:10.11646/zootaxa.3768.1.7. Hlavá P, Newton AF, Maruyama M. World catalogue of the species of the tribe Lomechusini (Staphylinidae: Aleocharinae). Zootaxa 2011;3075:1–151. Danoff-Burg JA. Evolving under myrmecophily: a cladistic revision of the symphilic beetle tribe Sceptobiini (Coleoptera: Staphylinidae: Aleocharinae). Systematic Entomology 1994;19:25–45. doi:10.1111/j.1365-3113.1994.tb00577.x. Orgogozo V. Replaying the tape of life in the twenty-first century. Interface Focus 2015;5:20150057–11. doi:10.1098/rsfs.2015.0057. Stern DL. The genetic causes of convergent evolution. Nature Reviews Genetics 2013;14:751–64. doi:10.1038/nrg3483. Gallant JR, Imhoff VE, Martin A, Savage WK, Chamberlain NL, Ben L Pote, et al. Ancient homology underlies adaptive mimetic diversity across butterflies. Nat Commun 2014;5:1–10. doi:10.1038/ncomms5817. Pardo-Diaz C, Whibley A, Supple MA, Saenko SV, Wallbank RWR, Wu GC, et al. The gene cortex controls mimicry and crypsis in butterflies and moths. Nature 2016;534:106–10. doi:10.1038/nature17961. Hof AEV, Campagne P, Rigden DJ, Yung CJ, Lingley J, Quail MA, et al. The industrial melanism mutation in British peppered moths is a transposable element. Nature 2016;534:102–5. doi:10.1038/nature17951. Zhen Y, Aardema ML, Medina EM, Schumer M, Andolfatto P. Parallel molecular evolution in an herbivore community. Science 2012;337:1634–7. doi:10.1126/science.1226630.